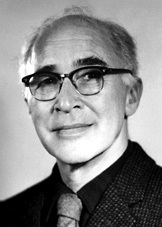 George Wald, Higgins Professor of Biology at Harvard, shared the 1967 Nobel Prize in Medicine or Physiology for research on how the eye sees and passes visual images to the brain. One of the first academics to speak out against U.S. involvement in the Vietnam War, he was a hero to many students in the 1960s. He also addressed such issues as the arms race, nuclear power and weapons, and human rights. In 1932 to 1934, Wald did research in Germany, and then at the University of Chicago. He joined the Harvard faculty as a tutor in biochemistry in 1934 and spent the next 43 years teaching and doing research at the University. His research included studies of how vitamin A improves vision. He also studied how cells in the retina perceive color, black and white and pass images to the brain. Wald’s collaborators included Ruth Hubbard, a biochemist whom he married in 1958.